The Fuji XF27mm f/2.8 Lens is a compact X-mount lens with a fast f/2.8 aperture for everyday casual shooting. The large f/2.8 aperture broadens users’ scope of photographic expression for low-light photography and scenes with a beautiful bokeh effect. 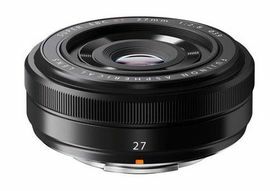 This lens has a fixed focal length of 27mm (41mm in 35mm format equivalent), offering a field of view similar to the human eye, capturing each scene as you see it. Weighing 78g and measuring 23mm in length, this truly is a portable travel lens that delivers great picture quality in a wide range of scenes including landscapes, portrait, night scenes, gigs and your everyday snaps.